In the last volume of London Diver, I sang the praises of the diversity and quality of wonderful seafood we have in the coastal waters of the UK. We are lucky – no doubt about it, to have such a grand selection. However we also have to be really careful not to get complacent. Recently the BBC ran the pilot episode of Saving Planet Earth, during which we witnessed the effects of careless, thoughtless fishing designed to meet the massive demands of the international market. There were images of turtles, sharks and dolphins caught in the remains of fishing lines and nets, we saw images of huge trawlers scooping every living thing out of the oceans, when all they are interested in catching is tuna – anything else that is caught, is thrown back into the sea. Dead! Quite simply, this is not sustainable. Water – more importantly, the oceans, are the single most important element of life on our planet. 80% of the Carbon Dioxide that we are responsible for producing, is converted back into Oxygen by the organisms that live in our oceans – this is far more than the rain forests. And every living thing in the ocean, is a vital link in the food chain – remove one link, you break the chain, and the consequences are immeasurable. Japanese trawlers sail out into the Pacific for weeks on end, freezing their catch immediately. Often, they are accompanied by spotter planes that fly ahead looking for schools of tuna from the air. The pilots then radio ahead to the boats with GPS coordinates, and the boats close in on their target! How can tuna stocks be maintained with this approach? Another practice that is adopted is to have two giant trawlers, hundreds of meters apart with a net stretched out between them – literally scooping up everything that swims between them. All this, to satisfy the demand for tuna in the Tokyo fish markets, where the largest, grade A tuna can be worth as much as $750,000. This approach is destroying our oceans and this is already starting to have an effect on humans. A leading government advisor on environmental issues recently warned that if we do not change the way we fish, within 25 years, humans will start dying as a result of the damage we are doing to the oceans. 25 years – that's not our grandchildren – or our children – that is us. Our generation. And it's just around the corner! Iceland has recently lifted it's ban on whaling. A photograph was published of the first whaler leaving port since the ban was lifted. In the background, a ship so vast that it made the whaler look like a canoe was leaving port at the same time. The ship was a ferry, taking tourists on whale watching trips. The irony of this situation was frightening. A single whale can be worth as much as £100,000 to the fishermen. The tourist trade, is worth less! Something wrong with that picture? I'd say so! As divers, I am certain that you will all appreciate the severity of this situation. There is overwhelming evidence that climate change is being fuelled by human activity. We have to change the way we live and this includes changing the way we fish. The salmon fishing industry is leading the way with regards to ensuring that stocks are replenished. 20 years ago, you could go to a Scottish river in August, cast out a fly, and in a day, be certain to catch a beautiful wild salmon. Now, you'd be lucky to catch one in two weeks of fishing. BUT, there is light at the end of the tunnel – Wild Atlantic salmon is now easy to find in the UK – don't bother with that farmed stuff you get in most supermarkets. (Did you know that wild salmon is actually a pale pink colour, not that bright pink that most people are accustomed to – the salmon farms have colour cards (like Dulux colour charts) and can alter the colour of the fish's flesh by changing it's feed!) Atlantic salmon also has the benefit of being on our doorstep, and in a world where the focus is now on carbon footprints, this is an important factor. If you must buy farmed salmon, at least make sure that it is organic, 'Blue Chip' salmon. These fish are fed natural feed and kept in pens with a current flowing through so that the fish have to swim to avoid being crushed against the side of the net. Organic salmon are also limited in the number of fish per square foot of pen, ensuring the fish have plenty of space and are not crushed. These factors ensure fish that are lean and fleshy, as opposed to those fish that spend their lives stationary in stagnant water and are high in saturated fats and oils – not healthy! Ideally, go to your local fish monger, or sometimes even the fish counter in the supermarket and buy the wild stuff – it is a different product, and is fished from sustainable stocks – the boats rotate their locations year by year to allow stocks to replenish... So simple but it works – salmon levels in Scottish rivers are on the up again! So now for the important bit – cooking the catch! Meanwhile, heat a large, non stick frying pan until really hot. 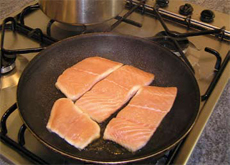 Add a tablespoon of olive oil, and place the lightly seasoned salmon fillets, skin side down in the pan. Lower the heat to stop the skin from burning. Cook until the salmon is just slightly pink in the middle, but feels firm when pressed lightly. Add the crème fraiche and mussel cooking liquor to the leeks and boil quickly for 1 minute before adding all the mussels and the chopped chives. Spoon into large bowls dividing the liquor between the 4 bowls. 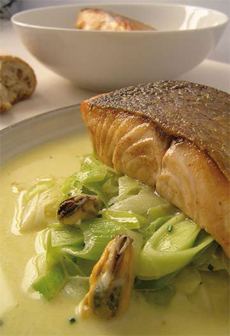 When the salmon is just cooked, (remove the skin if you wish) serve in bowls on top of the leek and mussel ragout.